The mountain gorilla, who got recognition after the research of the legendary primatologist Dian Fossey, is one of the world’s most endangered primates. The word “beringei” of its scientific name comes from the surname of Captain Robert von Beringe Friedrich, a man who in 1902 shot two animals, previously virtually unknown, which were mountain gorillas. The mountain gorilla differs somewhat from the eastern lowland gorilla (Gorilla beringei graueri) due to the habitat where they live. Their skin is thicker, and their dark fur longer and denser than the eastern lowland gorilla, to protect them from the low temperatures of their habitat. However, their back hair is shorter compared to the rest of their body. This coat is not present in the face, hands, feet, and ears that are hairless. Males develop a layer of silvery gray fur on the back and thighs, which grants them the name of “silverback” but not all become leaders of their group. Their stocky body, broad and rounded abdomen, long arms, narrow chest and elongated skull distinguish them from other primates. They have a large brain relative to their body size, strong jaws and 32 teeth adapted to a herbivorous diet. Their intestines are long enough to digest the foliage properly, and that is the reason for his prominent abdomen. They walk supported on their knuckles, but they can stand on their feet for a few moments and walk this way up to 6 meters. The mountain gorilla has a smaller size than the eastern lowland gorilla. An adult male has an average height of 1.50 meters and weighs 195 kilograms, but the female is only 1.30 meters tall and weighs about 100 kg. This subspecies shows sexual dimorphism, which is not always evident. Estimations indicate that there are only about 300 mature individuals left in the wild. The mountain gorilla lives in central Africa, in Uganda, Rwanda and the Democratic Republic of Congo. Their populations are present mainly in the Virunga mountains and the jungle of the Albertine Rift mountains, including the Bwindi Impenetrable National Park, the Mgahinga Gorilla National Park, the Virunga National Park and the Volcanoes National Park. Their habitat, usually dense mountainous tropical forests, can be found at altitudes up to 4.300 meters, habitually covered with fog. Many inhabit the fertile hills of the Karisimbi, Bisoke and Mikeno volcanoes. Mountain gorillas are mainly herbivorous, as all other types of gorillas. Their diet includes leaves, fruits, roots, bark, flowers, stems and buds, and occasionally small invertebrates, mainly tiny insects like ants, larvae, and snails. According to research they can eat as much as 142 types of plants, but only three types of fruits, this is because the area where they live is very limited in fruit trees; thus, leaves, stems, and buds are an 86 percent of their diet. They have a big appetite. Adult females can eat in one day about 18 kilograms of food, but males a lot more, they can eat more than 30 kilos in a single day. They hardly drink water, because they get it from the plants they eat. The mountain gorilla is a peaceful and social animal with a social structure based on family groups consisting of a dominant male, the “silverback”, a subordinated adult male, several sexually mature females and their offspring. In some cases, there are two male leaders. The group can live in the same area than other groups, but each group has its leader. He is responsible for the social binding and the group security, and if necessary, confront intruders or predators that menace the troop. The bond between females is not firm. Their principal concern is taking care of their young and staying close to the dominant male so he can defend them from any danger and guarantee the survival of their offspring. 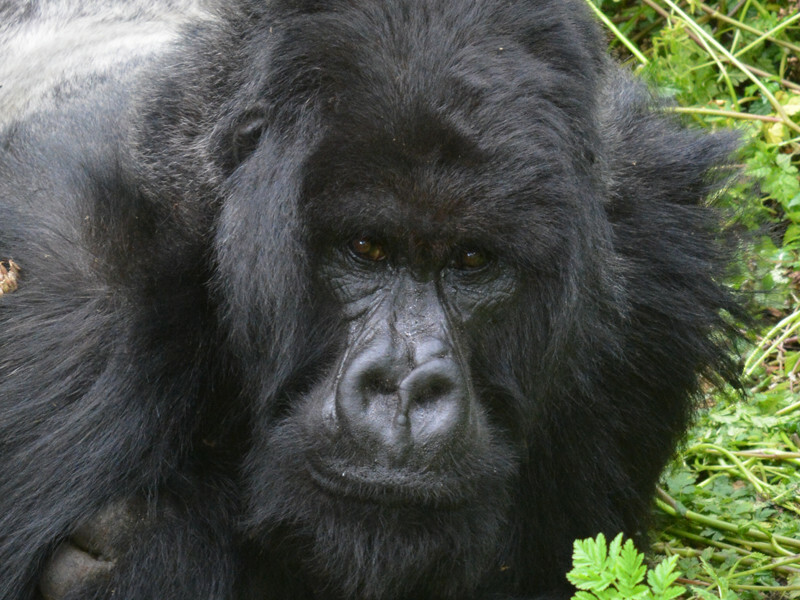 For example, if a mother dies, the “silverback” male takes the role of “mother” and devotedly care the orphaned infant. Both genders build nests to sleep and rest while they are not traveling. The young sleep with their moms during the initial years of their life. This subspecies spends less time on trees than the others. The mountain gorilla (Gorilla beringei beringei) is polygamous. Females reach sexual maturity before males, and once this happens, they can breed throughout the year. The problem is that they are fertile only 1 or 2 days a month, so the birth rate is very low. When a female becomes pregnant, the gestation period is 8.5 months. Usually, only one baby is born, weighing about 2 kilograms. The newborn is fed with breast milk and transported in the back or the belly of his mother. Infants learn through playing with their moms or other young in the group, but upon reaching sexual maturity they must leave their troop to search and join another. Very few gorillas stay in their birth group, if they do, it must be with the permission of the dominant male. The mountain gorilla is Critically Endangered (CR). Unfortunately, the mountain gorilla is Critically Endangered (CR) and is registered on the red list of the International Union for Conservation of Nature. Estimations indicate that there are only about 300 mature individuals left in the wild, which is the result of poaching, habitat loss, human-transmitted diseases, armed conflicts and wars in the countries where they live. Dian Fossey made outstanding conservation efforts for this endangered subspecies, and her legacy still continues. Many other organizations are concerned about the uncertain future of the mountain gorillas, and they have created educational, and awareness projects. One of the most important actions come from the African Wildlife Foundation, the Fauna and Flora International organization and the WWF, which in 1991 created the “International Gorilla Conservation Program”, and keep working to manage the habitat of these primates.